AW#43 deadline has been extended until March 2. The good old days of Scientific Illustration. “Devils Tower lies in a region of Triassic and Jurassic sedimentary strata. In Fig. 1 the flat valley in the foreground is the Gypsum Spring formation (Triassic), and the cliffs in the middle distance are members of the Sundance Formation (Jurassic). The tower itself is considered to be Tertiary on geological evidence.” from Bassett, W. A. 1961. 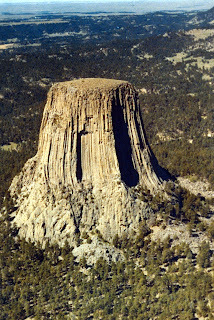 Potassium-argon age of Devils Tower, Wyoming. Science 134: 1373. 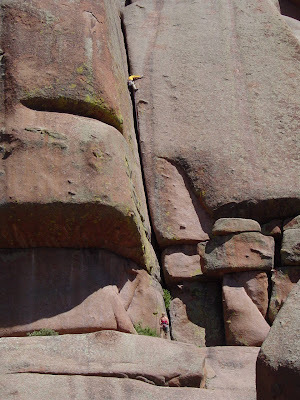 A rock climber marvels at the undulating thin cracks on Devils Tower ... how convenient! Climbers know the rock they climb on intimately. They know the basic types -- sandstone, limestone, granite. They are experts on the nature of the rock surface, whether it is smooth or has features -- tiny crimper edges, big buckets, knobs, pockets, slopers, jugs. They are acutely aware of the angle of the rock face and its height. They know the nature of the fractures -- narrow vs. wide, undulating vs. parallel -- critical for hand and foot holds and gear placement. They worry about the competence of the rock; might those hand holds or even an anchor bolt pull out? Climbers clearly are a ready audience for stories about the geology of their playgrounds. Haas wonders, as he makes his way up Main Street (5.10a). Many climbing guidebooks include something about the geology of the area, but these explanations typically are brief, sometimes just the rock type and its age. Fortunately there is an alternative. 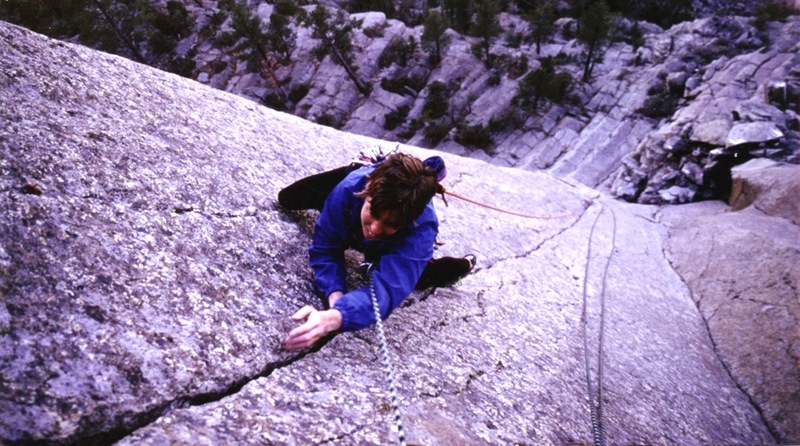 Flakes, Jugs, and Splitters: A Rock Climber's Guide to Geology, by geologist/climber Sarah Garlick, covers 50 climbing areas in North America as well as some in Africa, Asia, Australia, Antarctica, South America and Europe. This is an ambitious project! Climbing areas vary widely in rock type and geologic history, and most include at least one geologic mystery. A lengthy paper could be written on each I’m sure. 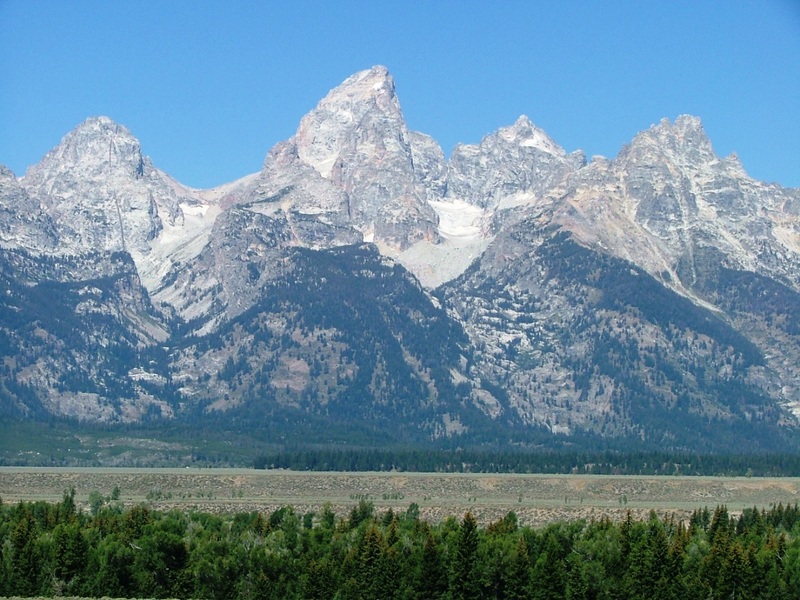 How old are the Grand Tetons? ... depends on what you mean. They are composed of some of the oldest rock in North America (the granite is 2.5 billion years old, the gneiss 2.7!) 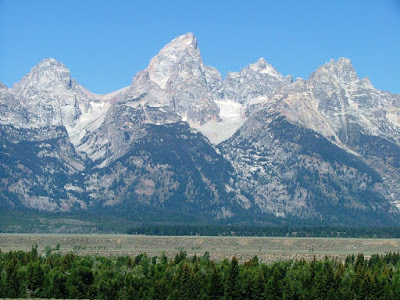 but are among the youngest mountains, uplifted less than 2 million years ago. Though organized by area and focused on specific features, the book includes more than just local geology. Garlick does a good job of describing the bigger picture. For me, the explanations of plate movements, collisions, rifts, jostling and passive margins and how they relate to climbing areas are the most interesting parts of the book. For example, we can’t explain the Gunks in New York without invoking 1) mountain-building 450 million years ago when a chain of islands collided with the eastern margin of North America, resulting in erosion and deposition of sediments that would become the hard conglomerate we climb on; and 2) tectonic compression 300 to 250 million years ago during the formation of Pangaea that tilted the strata and produced those bomber holds, making some of the big Gunks roofs surprisingly easy to climb. Thank you plate tectonics. 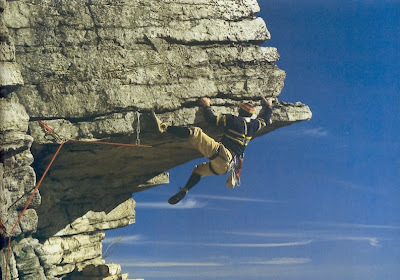 Shawangunk Rock Climbing, 1985. Posted at SuperTopo. A well-illustrated brief overview of the history of the Appalachian Mountains is presented in a three-page “sidebar”, providing the context for many of the climbing areas in the eastern US. A similar approach is used for the Rockies (“A Short History of Colorado”). Other shorter sidebars explain diverse topics such as the multitude of granite plutons in California, the Ancestral Rockies and the mysterious Gunks quartz. There are ample illustrations of geologic phenomena and processes throughout: plate tectonics, uplifts and basins, stratigraphic columns, salt anticlines, metamorphic core complexes, ancient landscapes and many more. 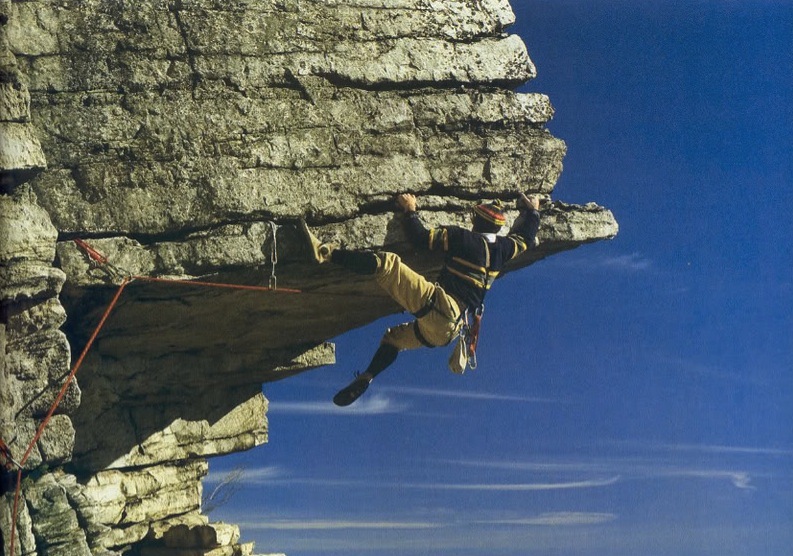 And of course there are spectacular photographs of crags and climbers. This is a book worth perusing from cover to cover, in addition to studying one’s favorite crags -- perhaps a good diversion for rainy days. 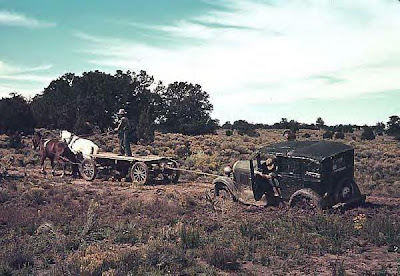 Excerpt from "A Short History of Colorado"; click to view. Given the number and diversity of rock climbing areas, this kind of book can provide only a quick look at a selection of crags. 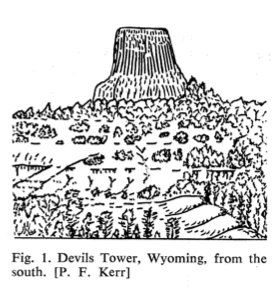 For example, discussion of Devils Tower includes just one of the theories behind this puzzling rock, but that’s understandable -- it has proven to have a history mysterious enough to support multiple possible explanations. Less than a page is devoted to Yosemite Valley, in spite of its important place in the history of climbing (but see also the granite of the Sierra Nevada). The Adirondacks are omitted entirely. Even so, I think Garlick has made good choices about what to include; the result is a collection of interesting wide-ranging stories about the diverse materials and histories of the mountains and rocks we climb. If you are a geologically-challenged climber, this book will make a bit of a geologist out of you and I bet you will enjoy it, even though sections may prove to be somewhat technical (a glossary would have helped). 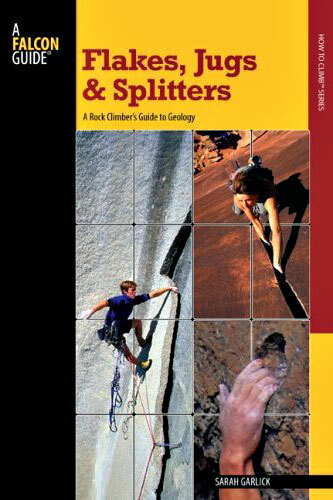 If you are a geologist that climbs, the book provides introductory material as well as references for further research. I am an amateur geologist and casual climber -- for me, it was a great read and will be a good reference in the future. F, J, & S won Best Book in the Mountain Exposition category at the 2009 Banff Mountain Film Festival. 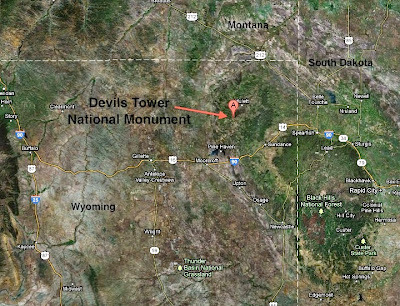 Devils Tower -- what’s on top? UPDATE: see Devils Tower--what's on top? (updated) for results of a 2016 botanical study of the summit. 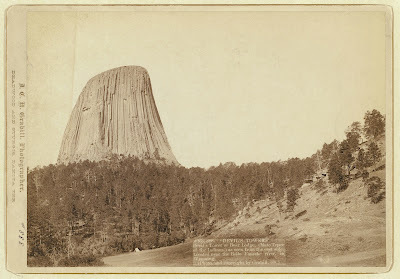 Devils Tower, in the Black Hills in northeast Wyoming, USA. Photo by John C. H. Grabill, ca. 1888. Devils Tower National Monument is a small park containing a huge rock -- a giant truncated fluted monolith that rises 800 feet above the pine ridges and prairies of the northwest Black Hills. The park is only about a square mile in area, with a significant chunk of that taken up by igneous intrusive rock (phonolite porphyry), but it includes a good representation of the area’s vegetation: ponderosa pine forest; woody draws with bur oak, green ash, hawthorne, chokecherry and wild plum; mixed grass prairie; and riparian woodland along the Belle Fourche River. But what’s on top? Permo-Triassic redbeds of the Spearfish Formation. Courtesy ArcGIS Online. The broad rolling summit of Devils Tower is covered in rocks, grass, cactus, wildflowers, and surprisingly, sagebrush -- specifically Wyoming big sagebrush, Artemisia tridentata ssp. wyomingensis. Why is this a surprise? 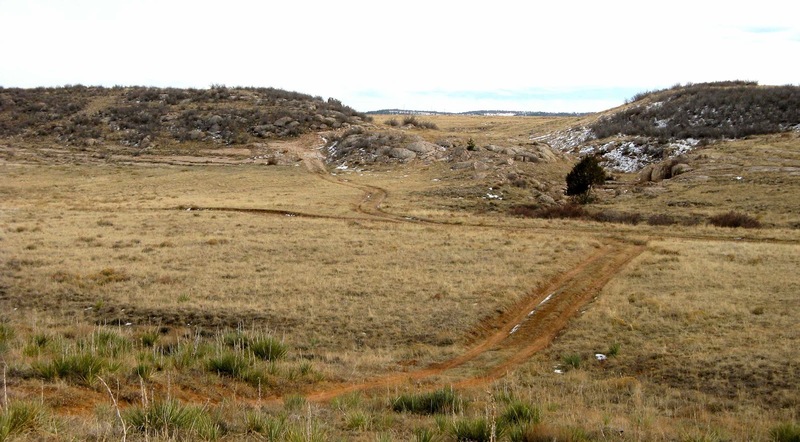 because big sagebrush is uncommon in the Black Hills, restricted to the margins of the uplift. It is characteristic of drier habitats in the basins to the west. The Black Hills, even at lower elevations, are more mesic (moist), with forests, woodlands and relatively-lush mixed-grass prairies, like those of the Great Plains to the east. Photo on left courtesy USGS Photographic Library. Climber on summit sits next to Wyoming big sagebrush; turkey vulture in distance. It’s wonderful when nature surprises us like this -- it gives us a chance to think and speculate, to come up with an explanation. Although the top of the Tower receives the same amount of precipitation as the surrounding area, I suspect is it effectively drier due to the rocky substrate with limited soil development. Sagebrush is better suited for this site. Collecting vegetation data on the summit of the Tower ... someone has to do it. 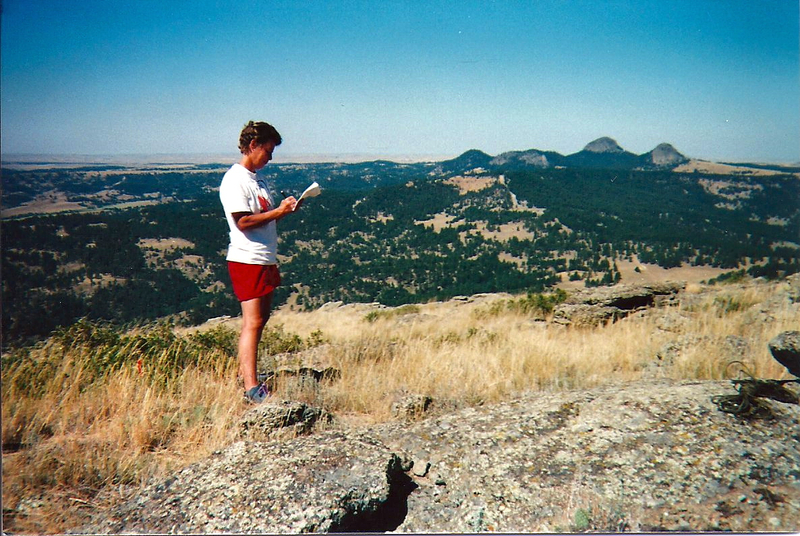 Little Missouri Buttes in background are igneous intrusions similar to Devils Tower. 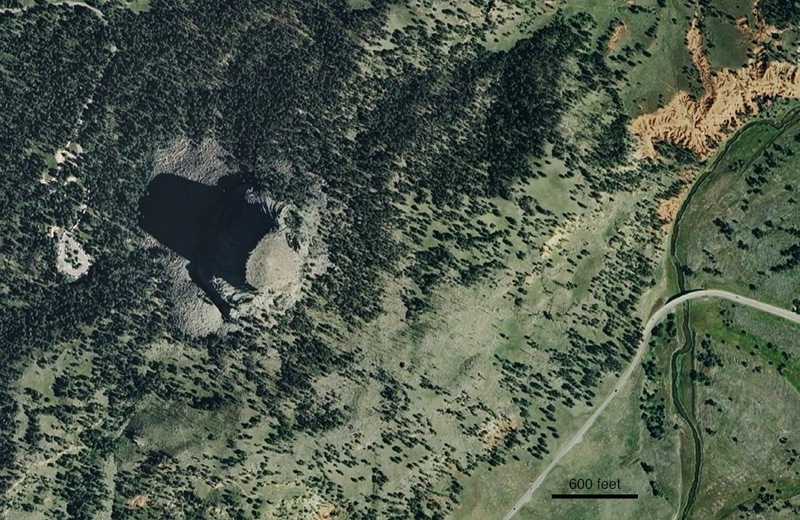 At least 28 vascular plant species grow on the summit of Devils Tower, including several others characteristic of the sagebrush grasslands of the basins to the west, such as prickly pear cactus and bluebunch wheatgrass. 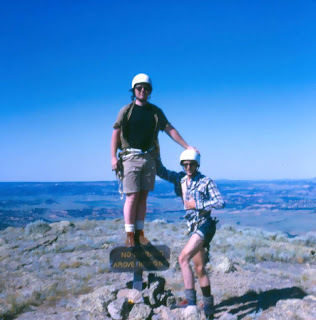 Summit ca 1970. Sign reads NO CLIMBING ABOVE THIS POINT. northwest part of the Black Hills. Courtesy Google Maps. 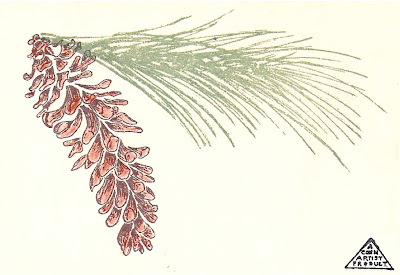 Pinus sp. Rubber stamp art by Jan Conn.
Do you remember leaving home? I do -- like many teenagers, I could hardly wait and I seized upon Gibran’s words when I read them. Now years later they still make sense to me, though they seem a bit maudlin. But the feelings of a parent (which I am not) are very different ... a human parent, that is. Isn't it interesting that many humans have a hard time letting their children go, while most animals and plants take the opposite approach -- rebuffing, excluding and even hurling their progeny into the unknown. Plants will go to great lengths to send their propagules packing. 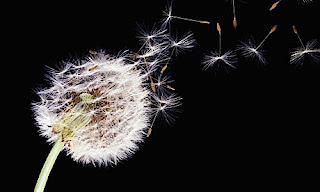 Some seeds simply fall to the ground and never go much further, but many are dispersed far and wide. Most end up in inhospitable places with their mission unfulfilled, but some will colonize new sites and even expand the range of the species. Wind and water are common means of scattering seeds, and plants have many adaptations for these vectors. Among the more familiar are the plumose seed tails of dandelions (above, courtesy The Guardian) and the buoyant outer coat of the coconut (below). Some plants enlist animals, a strategy called zoochory. Seed transport internally is called endozoochory; epizoochory refers to transport on the exterior of an animal. 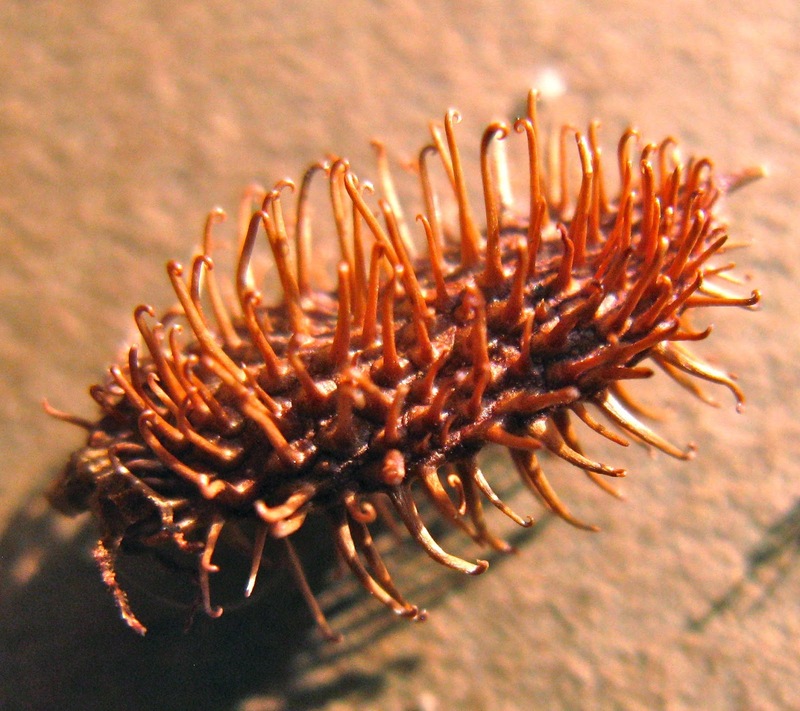 Epizoochory is a relatively rare means of seed dispersal, used by less than 5-10% of all plant species, but it can be quite effective, especially if the animal is wide ranging (Sorenson 1986). To right, Sparky participates in epizoochory (click to view). Adhesion mechanisms for epizoochory include sticky mucus and, more commonly, structures such as barbs and hooks. 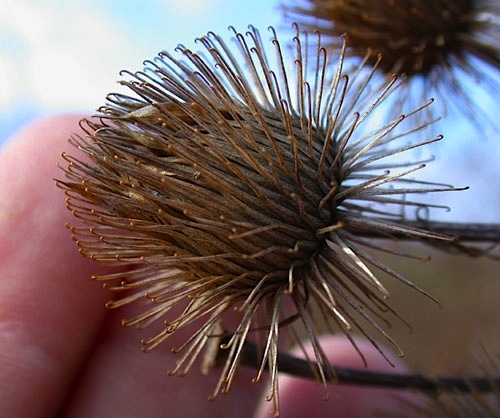 The hooks on the burrs of burdock (Arctium spp., photo to left) were the inspiration for Velcro. In 1948, Georges de Mestral, a Swiss electrical engineer, was pulling burrs from his dog’s fur after a day of hunting, and became curious as to what gave them their adhesive power. A look under the microscope revealed a fearsome array of hooks, prompting de Mestral to wonder if something similar could be constructed for use as a reversible fastener. By 1951 he had a working product, the first patent was granted in 1955, and after additional refinement, Velcro was introduced commercially in the late 1950s. Though slow to be accepted initially, it eventually became so popular that the registered trademark “Velcro” is now a generic term for hook-and-loop fasteners around the world. The interesting story of the “zipperless zipper” can be found here. Velcro up close -- hooks on left, loops on right. 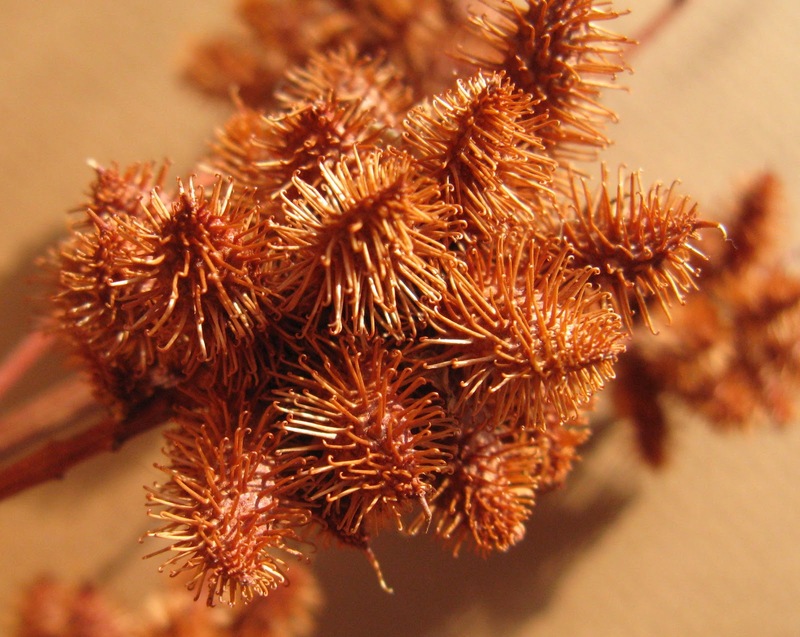 The burrs that Sparky brought home are from our wild licorice, Glycyrrhiza lepidota. 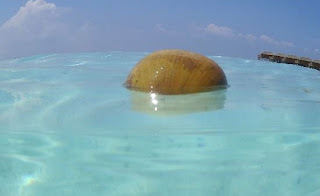 The name of the genus comes from the Greek glykys -- sweet -- and rhiza -- root. Roots of most species of Glycyrrhiza contain glycyrrhizic acid, the active ingredient of the sweet distinctively-flavored extract used in tobacco products, pharmaceuticals (to mask bitterness), beverages (foaming agent) and of course candy, although many “licorice” candies now contain anise instead. 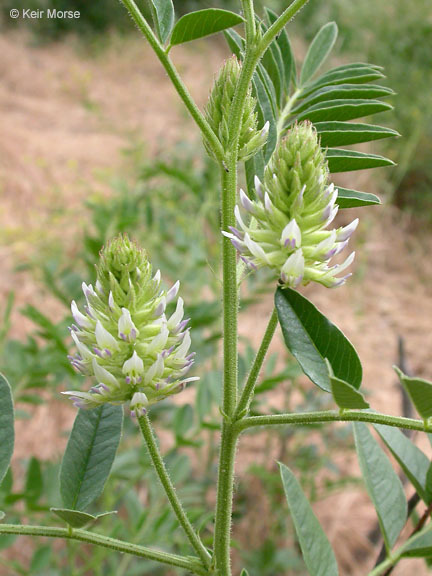 Commercial licorice products come from the cultivated licorice, Glycyrrhiza glabra, but the root of our wild licorice was once a source of sweetener as well, for Native Americans and early settlers in the western United States. Today, wild licorice root is used in herbal and homeopathic remedies (here for example). Glycyrrhizic acid is known to have beneficial medicinal effects, mainly in diseases related to cortisol regulation, and the biochemical pathways and physiological mechanisms have been elucidated. However it is dangerous in large dosages, causing hypertension and even death. Dalton (2002) provides a succinct overview of the benefits and dangers of glycyrrhizic acid. 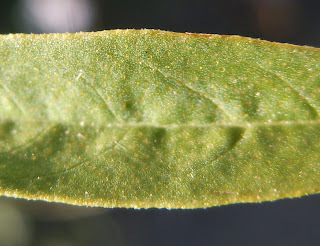 Glycyrrhiza lepidota, wild licorice (click to view). Wild licorice (also called American licorice) is native to and widespread in North America, growing in many different habitats. It is a robust perennial herb that can reach four feet in height. 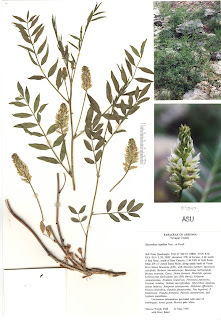 The underground part of the plant is robust as well, consisting of an extensive network of rhizomes and fleshy roots that produce adventitious shoots; thus wild licorice is rarely found as a single above-ground plant, but rather as large colonies. 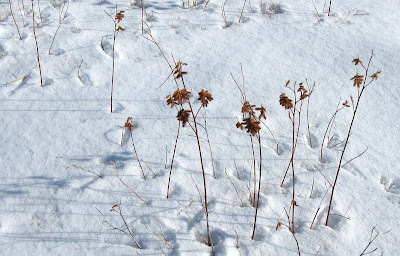 It is excellent browse for both wildlife and cattle (USDA NRCS), and yet is classified as a weed in many US states, for example Wyoming, North Dakota, Missouri and Nevada, probably due to its ability to persist and expand with disturbance. 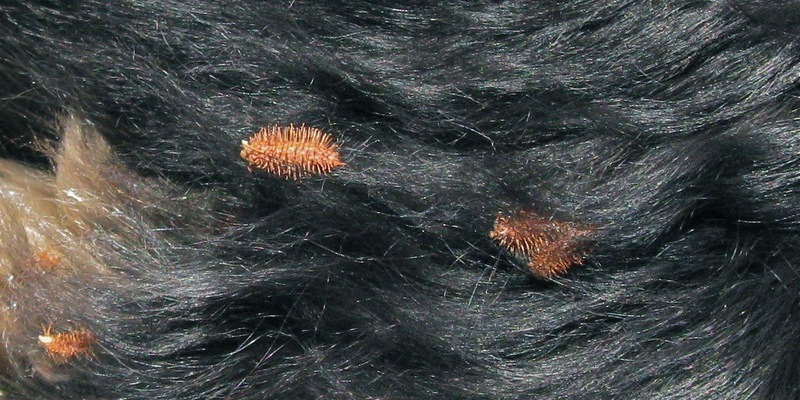 The burrs are more clearly a hazard for sheep ranchers, causing dockage if present in wool. Wild licorice is a member of the pea family (Fabaceae), and like many peas, its leaves are pinnately compound, i.e. 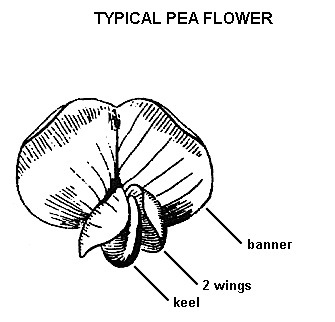 subdivided into leaflets arranged along the axis of the leaf. Look closely at the photo below and you can see that the leaves are glandular punctate, with tiny round resinous glands. 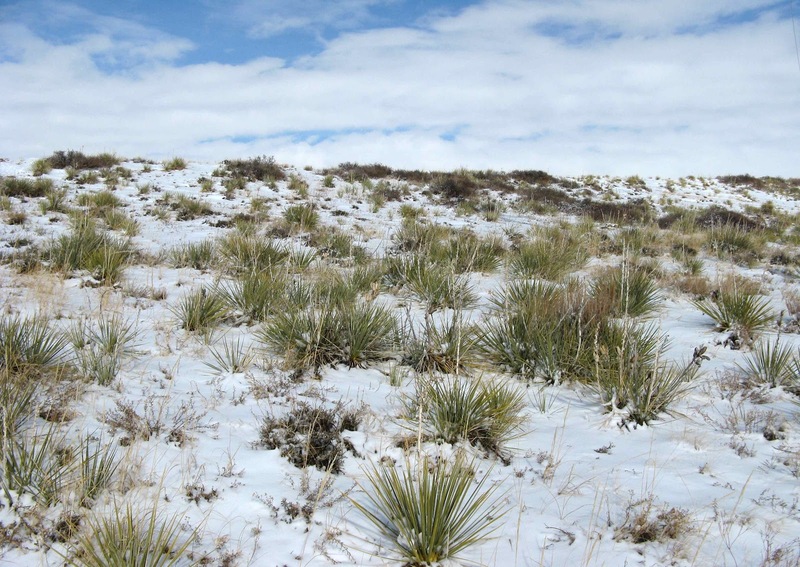 to the plant diversity of sagebrush steppes. Click to view glands. 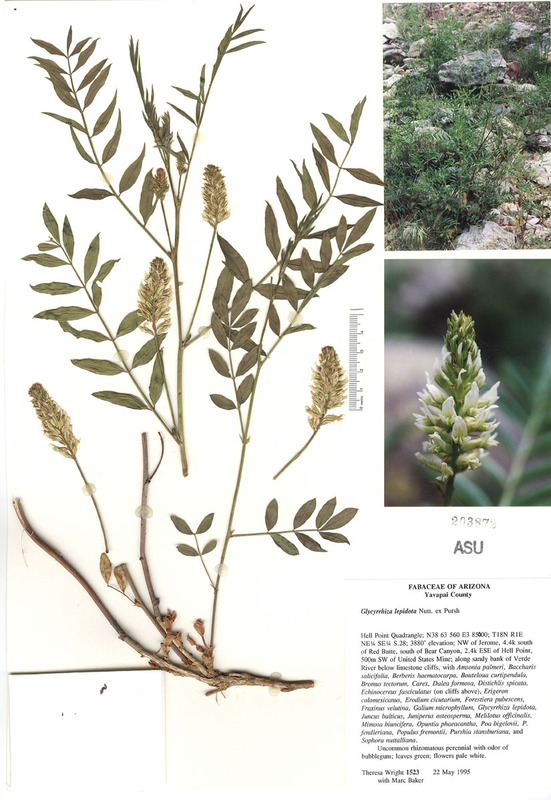 The flowers of the wild licorice are like most pea flowers, with characteristic petals -- a banner, two wings and a keel (photo above from CalPhotos; illustration to right from Montana Plant Life). And like all members of the pea family, its fruit is a legume. But what legumes! ... not exactly something you would put in the soup pot. Legumes (fruit) of wild licorice -- also known as burrs. By fall, the pretty flowers of the wild licorice are gone and the leaves have withered and died, leaving only standing dead stalks topped with menacing legumes. The wise walker with a dog avoids wild licorice patches this time of year. The tiny hooks are very tough, and sometimes burrs can be removed only with scissors. With time the tissues soften, and by late winter it’s fairly easy to pull licorice burrs from dog fur. By late spring, when the first new green growth is appearing, the previous year’s fruit are gone -- dispersed to parts unknown, and it is again safe to walk the river trails. Dalton, L. 2002. What’s that stuff? Licorice. Chemical & Engineering News 80: 37. Sorenson, A.E. 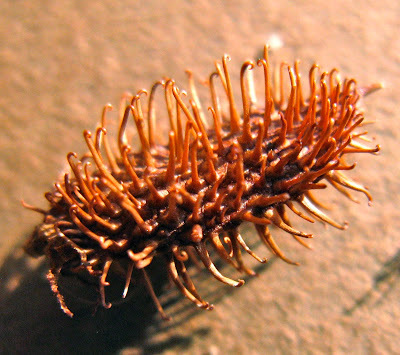 (1986) Seed dispersal by adhesion. Annual Review of Ecology and Systematics. 17: 443-463. USDA Forest Service Fire Effects Information System -- Glycyrrhiza lepidota. Accessed February 2012. 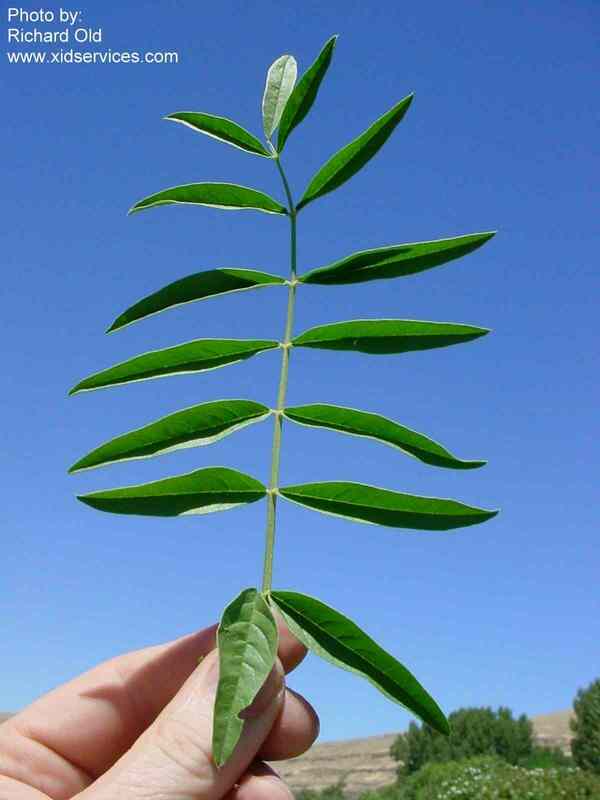 USDA PLANTS Database -- Glycyrrhiza lepidota. Accessed February 2012. Some folks say a man is made out of mud.1 Some would disagree. But no one who lives in this part of North America would deny that sometimes a man is covered in mud. 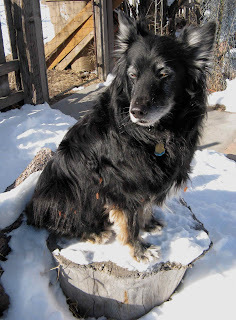 Dog feet are sometimes covered in mud too, leaving prints all over the kitchen floor on otherwise-wonderful days when the sun is out, temperatures rise well above freezing and the snow melts in the yard. Mud sometimes covers shoes and then turns hard as rock, relegating them to the pile of old-shoes-for-bad-weather-days. Mud makes field work no fun what-so-ever. To left, Clay covered in mud after a mountain bike race in southeast Wyoming, USA. Where I live, people both despise mud and fear it. The mud that develops on Cretaceous shales in the plains, basins and foothills is annoying at minimum and terrifying at its worst. 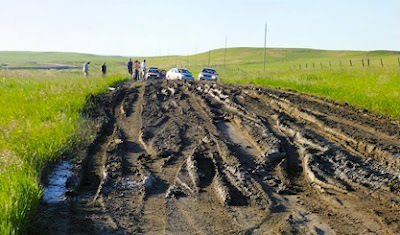 It is sticky and slippery at the same time, and dirt roads through badlands and breaks can send vehicles sliding down slopes on a rainy day. If you’re lucky, you only get stuck. Cretaceous mud in South Dakota. “The thing about gumbo is that you really can't describe to people what it's like, unless they've been stuck in it. You tell them it gets muddy, and they say they've seen mud. When you tell them they haven't seen mud like this, they just don't believe you” (Jack Horner, paleontologist, eastern Montana). Stuck ... ca 1940; no source given. What gives mud its evil powers? 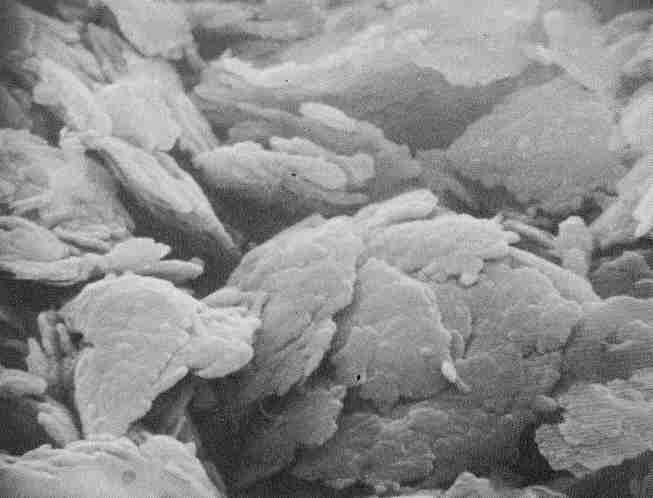 That would be clay, the smallest of the soil separates (particles). Soil with large amounts of clay absorbs water easily, and is sticky and slippery when wet. Most soils turn into mud when water is added, but clay-rich soils produce the most memorable mud. 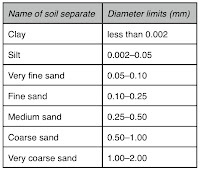 Table courtesy US Department of Agriculture. Being so small, a clay particle has a large surface area compared with its volume. Most clays are flattened or flaky, making surface tension attraction especially strong. And yet clay particles also slide past each other easily with the right amount of moisture, giving clay its characteristic plasticity and slipperiness. 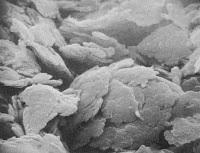 Scanning electron micrograph of clay on left. Clay-rich soils are not all bad. 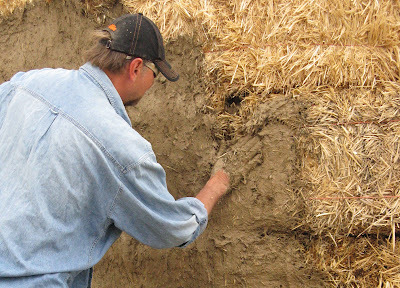 Clay holds nutrients as well as water, and shallow-rooted plants, especially grasses, thrive on these soils. But when the vegetation is removed, the evil mud appears. Grassland on fine soils (redbeds); shrubland on limestone hogback beyond; east margin Laramie Basin in southeast Wyoming. And yet mud in the proper context can be beautiful, awe-inspiring, spiritual. Consider adobe. Even the name is appealing. 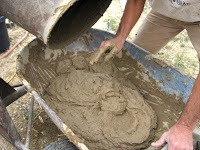 “Mud” is a single blunt syllable but “adobe” flows from one soft sound to the next. 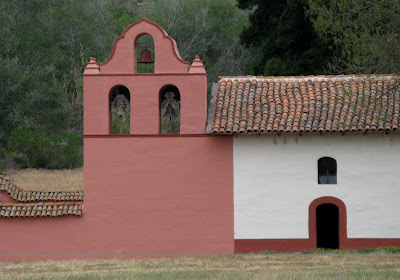 Made of simple sounds, the word is lovely in a straightforward way, like a mission church made of simple adobe walls. Misión La Purísima Concepción de María Santísima, near Lompoc, California. 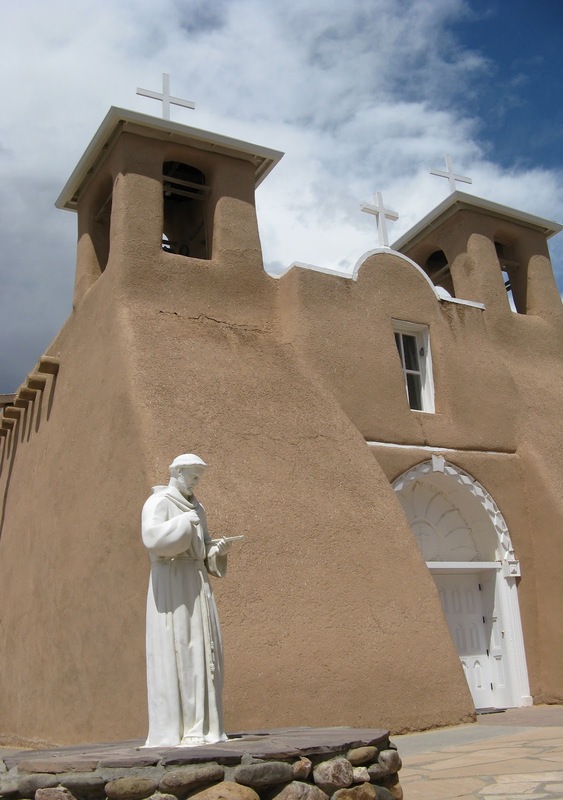 San Francisco de Asis church in Rancho de Taos, New Mexico. 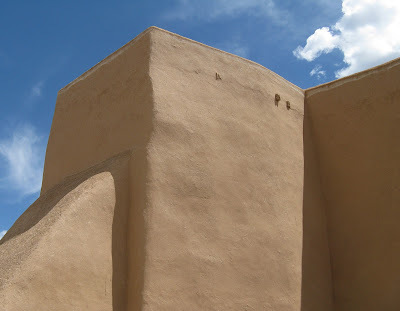 I am always moved by the impressive silence inside thick adobe walls. On one occasion I was the only visitor in the San Francisco de Asis mission church. As I sat amidst the colorful and mystical decor -- the Virgin, her Child, and a mulititude of saints -- there were no sounds other than my breath. 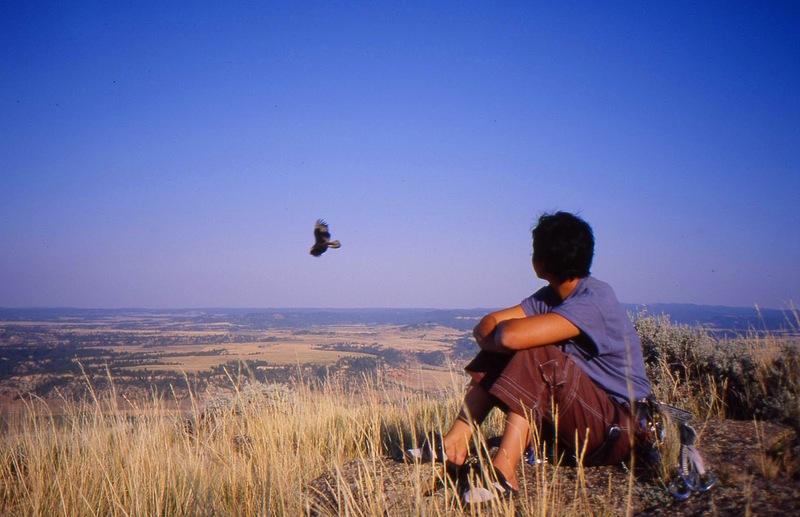 In such stillness it might indeed be possible to escape the world outside, to contemplate other realities. Adobe has long been used for construction. Being mud, it becomes rock-hard when it dries, the clay particles adhering tightly to each other. 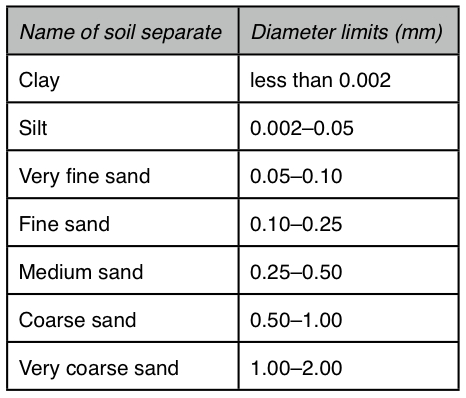 The correct mix of particle sizes is critical. 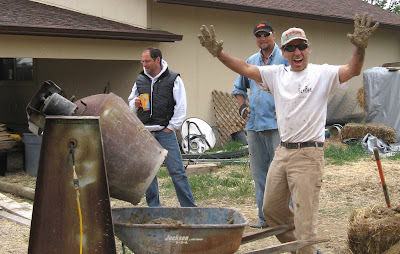 Too much clay and the adobe will shrink and crack with drying; clay must be less than 30% of the mix. 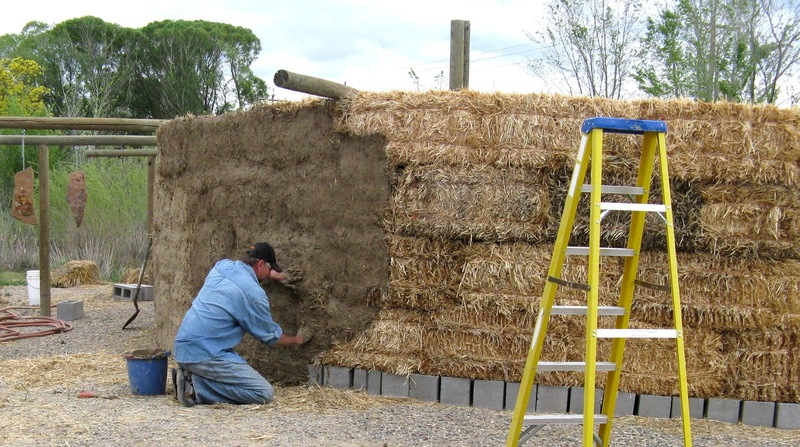 Traditionally, organic matter such as straw or manure has been added. Some consider it critical and analogous to rebar, but it is not structurally necessary and can lead to insect damage or rot, weakening the adobe. Sand is preferred. 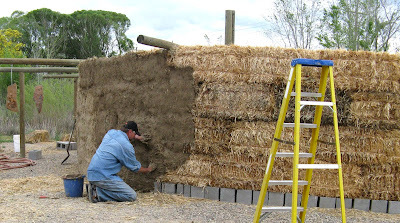 Even the best adobe will succumb to moisture, eventually disappearing altogether in the absence of protection. An impervious roof is required. Tejas at Misión La Purísima. The undulating earthy-red mission roofs that shed rain so effectively were mud-based as well. Tejas (roof tiles) were shaped by molding clay over logs, and then were baked. Often there was no good source of clay nearby, and instead it had to be extracted from mud in settling ponds. Below, the “church” under construction -- a straw bale observatory where seekers, with the aid of telescopes, will look beyond this world to the heavens. 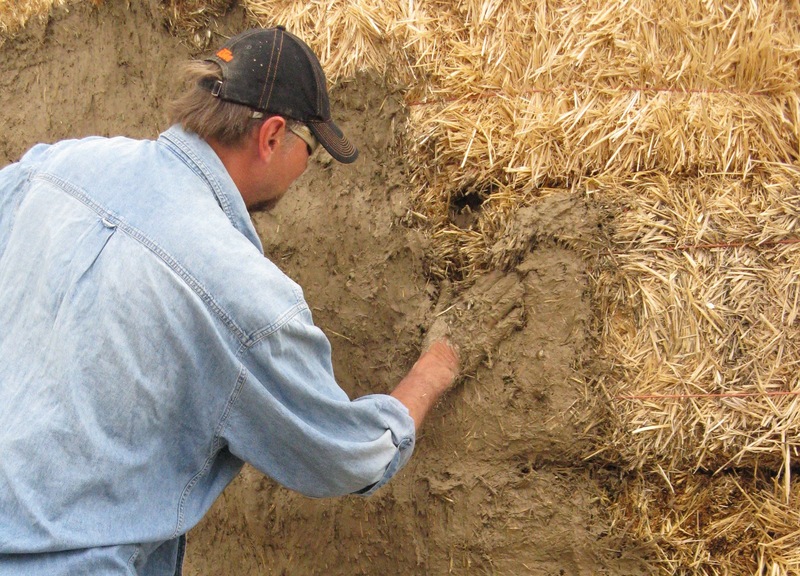 Mud on straw -- what could be more organic? even feels a bit spiritual! Danny is seized by the Power of Mud. Western Sky Planetarium, serving western Colorado and southern Utah. 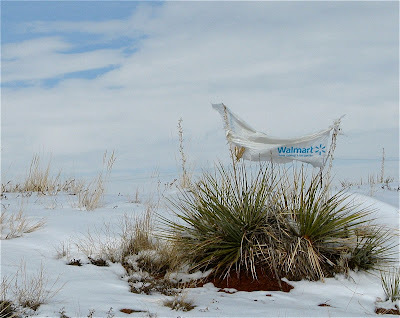 What are these plants doing, besides advertising for Walmart? They are photosynthesizing. While other grassland plants have shut down for the winter, Yucca glauca continues to crank out sugars when the sun is shining and temperatures are not too low. The tough fibrous leaves are resistant to freezing and desiccation, and their steep angles are conducive to catching rays when the sun is low in the sky. The Great Plains yucca, aka soapweed or soapweed yucca, is adapted to a broad range of climatic conditions, reflected in its distribution. 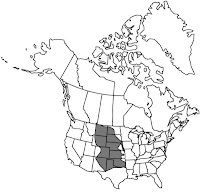 It the most widespread of North American yuccas, growing in grasslands of the Great Plains from north Texas to the southeastern tip of Alberta. 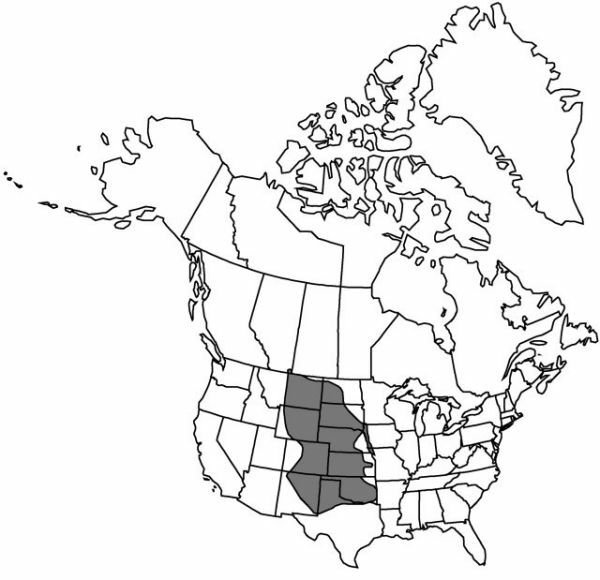 Map courtesy Flora of North America. 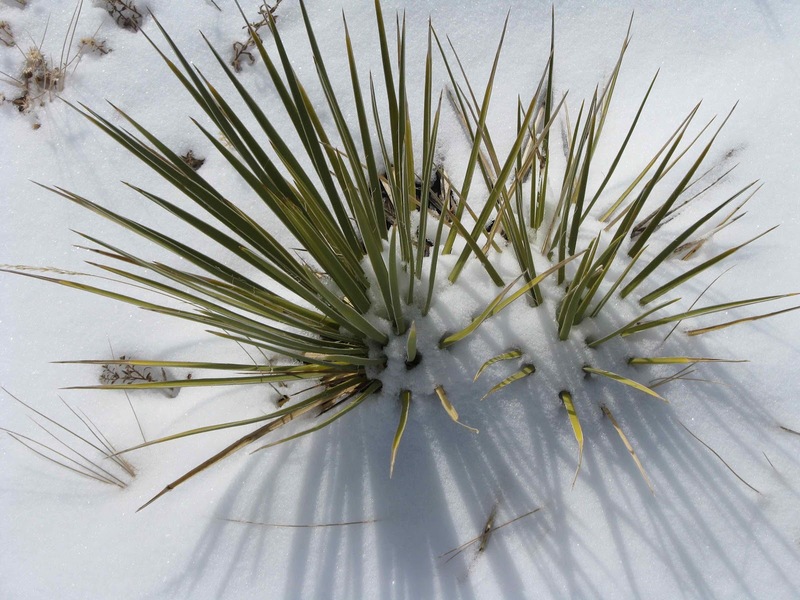 Yucca glauca does especially well in sandy soils, probably due to less competition from other plants. It is scarce to absent in areas covered in grass. The plants are deep-rooted and rhizomatous, often forming colonies of rosettes that are connected underground. 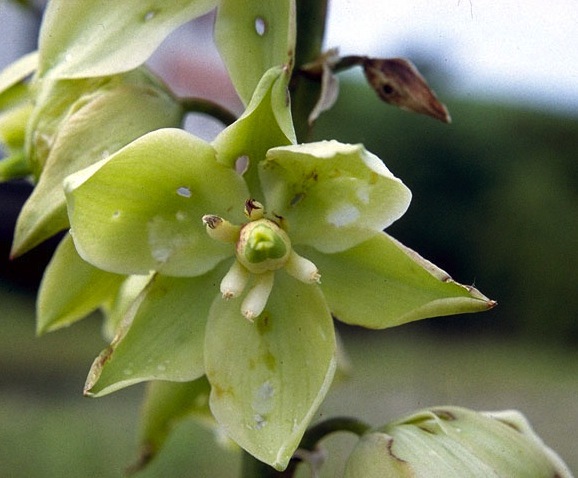 In Wyoming, yuccas bloom in June and July, producing large cream-to-greenish flowers that are tasty to people as well as to deer and other wildlife. But on this winter day, yucca flowers are only a dream. Photo by Lillian G. Flaigg; Lady Bird Johnson Wildflower Center. 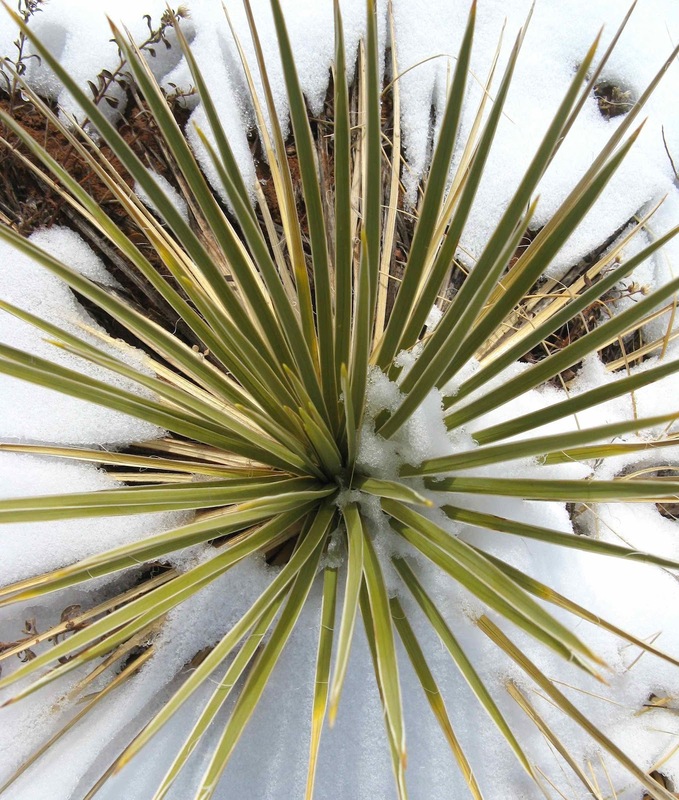 Great Plains yucca provides a bit of greenery in an otherwise-drab midwinter grassland. Creatures of Stone III -- the rest of the story?